I guess I've been a little quiet lately around here. I'm really okay. It's just been a weird week for me. It's been a little over two months since my dad died. Autumn has been a season of restoration for me--physically, spiritually, and emotionally--but it has also been a hard season. I've been thinking a lot about what I was doing this time last year. I was getting ready to go to Arkansas for a football weekend with my dad's side of my family. That was the last time I remember my dad being healthy. 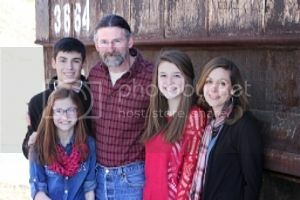 Just six days after I got home from that weekend, my dad called me from the hospital in Fayetteville, where he was experiencing symptoms that led to his pancreatic cancer diagnosis. He lived 9 months and one day after that phone call. My dad would have been sixty-four this past Monday. A couple of days before his birthday I found his baby book in some stuff I was sorting through. I am thrilled to have such an amazing keepsake, but it's hard to look through it because for me it represents something so final. The book chronicles the beginning days of his life, and yet I was there for so many of his last ones. Lots of conflicting thoughts and emotions. One of my dear friends is journeying through cancer with her dad right now. Their family has had a rough week and so many of her updates have left me with a familiar heaviness of heart. I know that there are no magic words to lessen her pain. I also know that sometimes the path she's walking will get narrow and she'll have to walk it alone. Other times that same path will widen so that friends (like me) can come and walk alongside her. Both the narrow and the wide are necessary. My heart has been very, very heavy for her this week because I understand a lot of what she's feeling. And it makes me sad all over again. I really am okay. Just giving myself some space (and grace) to be quiet, to hurt, to think, to pray, and to just be. Mere, these real feelings that you share with us are one of the many many reasons why I read your blog. You're just real and I love it. Lets have coffee sometime together, shall we?? So glad you shared your thoughts about your dad. Mom's homegoing was 6 years ago today, and I'm still processing the loss. Love you and am praying for you! My heart & prayers go out to you...I lost my Daddy almost 9 years ago (seems impossible to think it's been that long.) Wishing you peace and comfort. I was just thinking about your weekend in Arkansas last year because I was so sad that I didn't get to meet you. Something brought you to mind today, and I was wishing you lived closer. Or that I did! I am really privileged to have walked part of this last year's journey with you, and I am so thankful that this fall season has been restorative. I love that word and the significance of what it means in our lives. Relationships between fathers and daughters are complicated things. I know that mine with my father was. He didn't come into my life until 2 years before his death. I am thankful for the time that we did have. Miss your father by all means, and take all the time you need to heal. There is no magic length of time, just whatever is right for you. Glad you're taking care of yourself, Mer. Also good that you have a chance to sit with others as they struggle. As the Christmas season approaches, I'll miss Mom anew. She passed on just a few days later. Praying for you. So glad that you recognize that need in you, to be still and quiet. I'm praying for you and will lift your friend and her dad up as well. Debated whether I wanted to add my comment or not. Didn't want to add noise,since you're in quiet mode. But want you to know you're always thought of and prayed over. Quiet is good. Sorry you're heart is heavy, though. Wish I could bear even some of what you and whimzie are going thru. Thinking of you during this time.....Quiet time does help doesn't it. Virtual hugs to you friend! As someone who has lost a dad (not to cancer but to a plane crash)....I just want to tell you the first year is rough..because of all the "firsts"....you cry at the drop of a hat at the strangest things that remind you of your dad....you are fine one minute and then something triggers a thought and it hits you again. So sorry for the death of your dad. I'm going through the first year, too. My dad died in March after a long and horrible battle with Alzheimer's. Yesterday was homecoming at church, and I cried almost the entire hour. It was especially hard to hear the choir sing "How Great Thou Art." I sang that to my dad in his last months because it calmed him down. But at the end of the service, when each church member who had died the past year was honored, I felt proud to hear my beloved Daddy's named called. He loved that church. I've recorded my thought in my blog http://lisabatts.blogspot.com/search/label/Alzheimer%27s. These are the Alzheimer's posts. My favorite is Sept. 17, 2008. "When the Roll is Called Up Yonder I'll Be There." Now, I'm watching my mother fade away. She's had Alzheimer's for more than a dozen years. It doesn't get easier. Daddy's on my mind again this morning. It was comforting to see your post and to know I'm not the only sentimental daughter who misses her daddy.